The Sparkling City by the Sea shines even brighter on July 4. See the rockets’ red glare light up Corpus Christi Bay as a stunning fireworks show explodes over the downtown waterfront in this year’s celebration of the nation’s 242nd birthday. A Corpus Christi tradition since 1977, the Mayor’s Big Bang 4th of July Celebration returns for its 41st year. 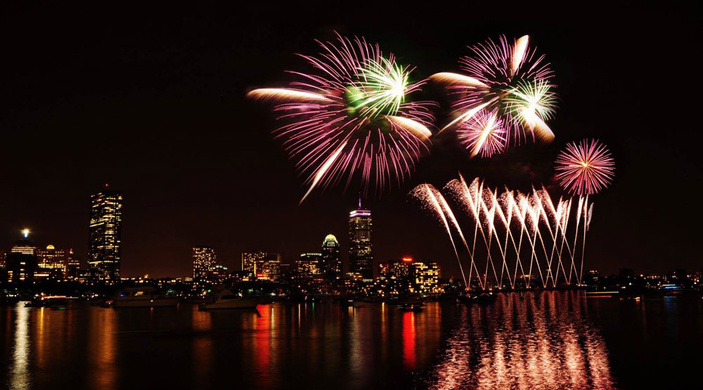 In true American fashion, the celebration goes all out with a parade, family-friendly activities, live music, a light show on the Harbor Bridge, and (of course) a stunning fireworks finale. Kicking off the day, a patriotic parade features dignitaries in cars, marching bands, decorated floats, prancing horses, roaring motorcycles, festive clowns, and more. The parade makes its way south down North Shoreline Boulevard from the S.E.A. District to Park Avenue. It ends just past Sherrill Park at the Great Lawn, where the whole area is blocked off for kids’ activities, food, and live music. The little ones will enjoy the Big Bang Kids Zone, equipped with everything for a good time. Attractions include rides, bounce houses, a petting zoo, a rock wall, face painters, and a special performance from Chica’s Rock. The Kids Zone will be open from 3-6 p.m.
Come hungry and get your fill from the Food Truck Court, located alongside the Kids Zone. The food trucks will be serving up a diverse array of food for purchase from 11:30 a.m.-9 p.m.
As soon as the sun falls, the night festivities begin. The Harbor Bridge Light Show illuminates the night at 9 p.m. and is choreographed to patriotic tunes. Listen along by tuning your radio to 92.7 FM, 95.5 FM, or 1440 AM. At 9:30 p.m., the H-E-B Fireworks Show bursts in the air. This year’s fireworks will be set off from a barge just north of People’s Street T-Head. Best viewing: anywhere along the bayfront. The Mayor’s Big Bang is free and fun for all to attend. View a map of the festivities here. Need help getting to the event? The Corpus Christ RTA is offering a complimentary park and ride service from 10 a.m.-midnight. Pickup is at City Hall, 1201 Leopard St. Drop-off is at Water Street between John Sartain and Williams streets. The Corpus Christi Museum of Science and History hosts its sixth annual 4th of July event in the S.E.A. District around the Water Garden Fountain. The museum provides carnival-style games, arts and crafts, music, and even a watermelon-eating contest. Exclusive seating on a platform behind the American Bank Center has been set up for the museum celebration. When the fireworks go off at 8:30 p.m., guests will have the best view in town. Red, White, and KABOOM! is from 6-10 p.m. Advance tickets cost $25, but are $30 at the door. Members save $5 either way. Parking is free and first-come first-served. The Corpus Christi Museum of Science and History is located at 1900 N. Chaparral Street. For tickets and more information, visit ccmuseum.com/July4th or call (361) 826-4667. Red, White, and BOOM Aboard Lex! Another great site to view the fireworks is from the flight deck of the USS Lexington Museum on the Bay. The museum will provide chairs, but guests are more than welcome to bring their own. Food, beer, and wine will be available for purchase (no outside coolers or food allowed). Red, White, and BOOM Aboard Lex begins at 7 p.m. Admission costs $25, $15 for members and military. The USS Lexington Museum on the Bay is located at 2914 N Shoreline Blvd. on North Beach. For tickets and more information, visit usslexington.com/red-white-boom-aboard-lex or call (361) 888-4873. In true American tradition, baseball will be played on July 4. The Corpus Christi Hooks meet up against the Arkansas Travelers at 7:05 p.m. in Whataburger Field. The game finishes with a fireworks show of its own. Get into the game for a discount! The Fourth of July is Whataburger Family Day: Buy one adult ticket, get one kids ticket free. Whataburger Field is located at 734 E. Port Ave. For tickets and more information, visit the website. Check out 101CorpusChristi.com/EVENTS to send details directly to your digital calendar or email information to your family and friends.